Doral Commemorates the First Ever Council Meeting 15 Years Later! The celebrations continue in the City of Doral, this time honoring the first ever Doral Council Meeting that took place 15 years ago, as well as the original City Council. 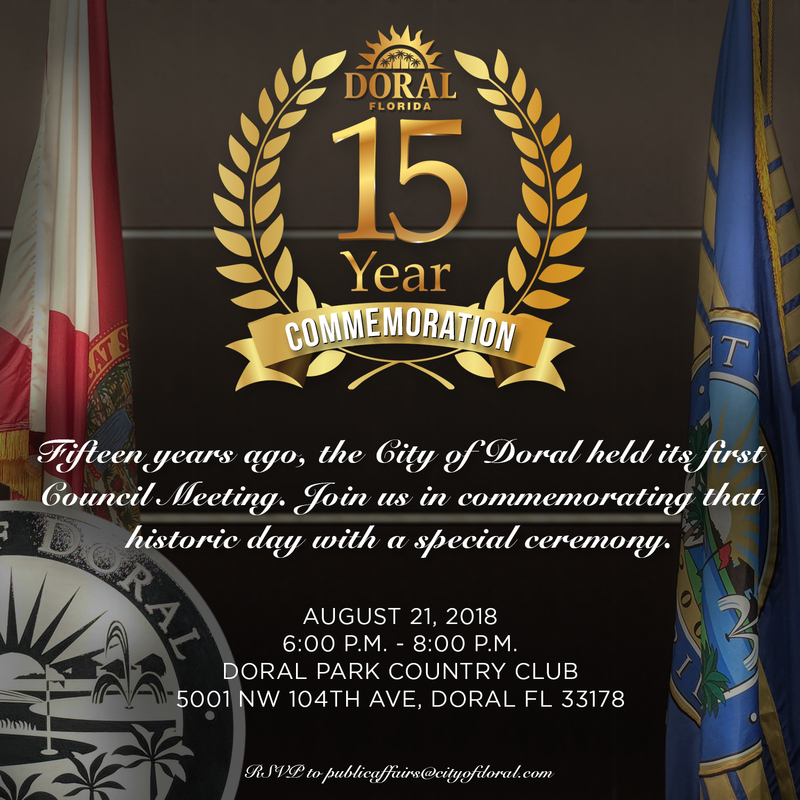 Doral, FL – The celebrations continue in the City of Doral, this time honoring the first ever Doral Council Meeting that took place 15 years ago, as well as the original City Council. To celebrate this historic moment, the Mayor and Council invite residents and members of the community to join them at the dedicatory reception that will take place on Tuesday, August 21, 2018, at the Doral Park Country Club, located at 5001 NW 104th Ave. The reception will begin at 6:00 p.m. and celebrates the last 15 years of accomplishments and community since our founding Councilmembers first gathered at the dais. The celebration will include a presentation with Mayor and Council, special video, food and music. WHEN: Tuesday, August 21, 2018 6:00 p.m. – 8:00 p.m.
WHERE: Doral Park Country Club, 5001 NW 104th Ave.